Background and objectives Twenty-four-hour urine and dialysate collections provide accepted means to assess adequacy in peritoneal dialysis (PD). Recent publications suggest that creatinine clearance (CrCl) estimated from the Modification of Diet in Renal Disease (MDRD) equations (eCrCl) accurately approximates measured CrCl (mCrCl) derived from 24-hour collections of urine and dialysate and might serve as an alternative means to assess small-solute clearance and adequacy in PD. Design, setting, participants, & measurements Post hoc analysis of data from patients enrolled in ADEMEX was used to assess agreement between mCrCl and eCrCl derived by four- and six-variable MDRD equations (4V-MDRDE and 6V-MDRDE, respectively). Additionally, associations among mCrCl, eCrCl, and survival were determined. Results Acceptable precision was observed between mCrCl and 4V-MDRDE-eCrCl and 6V-MDRDE-eCrCl for the entire cohort. Precision was markedly diminished when analysis was limited to functionally anuric patients with mCrCl < 12 ml/min per 1.73 m2. Although there was no association between survival and mCrCl, for every 1-ml/min per 1.73 m2 increase in 4V- and 6V-MDRDE-eCrCl, there was a 6% and 4% increase in risk of death, respectively. There was a negative association between MDRDE-eCrCl and creatinine appearance rates, suggesting MDRDE-eCrCl is significantly confounded by individual differences in muscle mass. Conclusions MDRDE-eCrCl provides demographically comparable values to 24-hour urine and dialysate collections across the ADEMEX cohort. However, MDRDEs should not be used to assess small-solute removal or adequacy in individual PD patients or to predict outcome in any cohort of patients over narrow ranges of limited clearance. The Modification of Diet in Renal Disease equations (MDRDEs) were originally formulated to estimate GFR in patients with chronic kidney disease (CKD) not on dialysis (1). The original validation study was performed primarily in middle-aged, Caucasian patients with a mean GFR of 38 ml/min per 1.73 m2 (1). Although the MDRDEs have demonstrated variable levels of imprecision when applied to other patient groups, low MDRDE-estimated GFR has generally been associated with reduced survival in nondialysis patients (2–17). Recent studies have attempted to extend use of MDRDEs to patients with ESRD. Khosla and Steiner demonstrated a correlation between MDRDE-estimated creatinine clearance (CrCl) and measured creatinine clearance (mCrCl) from 24-hour urine and dialysate collections of patients treated with peritoneal dialysis (PD) (18). Virga et al. also found a correlation between various GFR-estimating equations and mCrCl during PD and suggested that such equations could provide a simple means to assess adequacy in PD patients (19). On the basis of concern that practicing nephrologists and PD clinics might adopt MDRDE estimates of CrCl (eCrCl) as an alternative to the current gold standard of measured 24-hour collections of urine and spent dialysate, we explored the agreement between these two measures in another cohort of PD patients. Additionally, we evaluated the association between survival and MDRDE-eCrCl compared with the present gold standard in this population. All 965 patients enrolled in the ADEMEX trial were eligible for this study. ADEMEX was a prospective, randomized, controlled intervention trial that evaluated the effect of an increase in peritoneal clearance of small solutes on patient survival, the details of which are published elsewhere (20). Twenty-four-hour dialysate and urine collections and blood samples for multiple parameters, including creatinine, were obtained at baseline and every 4 months. All patients were followed for a minimum of 2 years, until death, loss to follow-up, transplant, or until recovery of renal function. Total mCrCl (ml/min per 1.73 m2) was defined as the sum of peritoneal creatinine clearance (pCrCl) + renal clearance (½ [renal urea clearance + renal creatinine clearance]) (rCrCl) determined by 24-hour collections of peritoneal dialysate and urine, respectively. As per Khosla and Steiner (18), the “GFR value” obtained by MDRDEs was used to obtain eCrCl and was compared with mCrCl, with both values normalized to 1.73 m2. eCrCl was derived using the following four (4V-) and six-variable (6V) MDRDEs (ml/min per 1.73 m2) originally described by Levey et al. (1): 4V-MDRD (race factor ignored) clearance = 186 × serum creatinine−1.154 × age−0.203 × (0.742 if female), and 6V-MDRD (race factor ignored) clearance = 170 × serum creatinine−0.999 × age−0.176 × (0.762 if female) × blood urea nitrogen0.170 × serum albumin0.318. Twenty-four-hour total mCrCl was compared with MDRDE-derived eCrCl on the basis of ADEMEX treatment group differences and the level of agreement between different methods of measuring CrCl. Additional analyses were performed comparing “pure” mCrCl (with the renal component of CrCl unadorned by renal urea clearance) with MDRDE-eCrCl. The agreement between mCrCl and MDRDE estimates was determined using a Pearson-type correlation coefficient (r) and a concordance correlation coefficient (CCC). The former reflects the best-fit line (e.g., ordinary least-squares regression) can explain variation in data and is a measure of precision between two methods, but not of accuracy. The CCC reflects how the line of identity can explain variation in data and is a measure of precision and accuracy between two methods. In longitudinal studies such as ADEMEX, CCC has two components—the intra-CCC and inter-CCC. The sum of these represents the total CCC. Intra-CCC estimates the level of agreement within a method (e.g., 24-hour mCrCl) when measured repeatedly on the same subject over time. The inter-CCC measures the level of agreement between two different methods (e.g., 24-hour mCrCl versus 4V-MDRDE-eCrCl) in the absence of any intrasubject variation. The total CCC measures the total level of agreement, accounting for the intramethod and intermethod agreement. The associations between mCrCl and MDRDE-eCrCl and survival were determined using time-dependent Cox proportional hazards models. These were adjusted for baseline age, gender, diabetes, serum albumin, and normalized protein nitrogen appearance. mCrCl and MDRDE-eCrCl were modeled as continuous variables and as quintiles. Comparisons between the intervention and control groups with respect to mCrCl, MDRDE-eCrCl, and serum creatinine (SCr) were carried out using a repeated-measures ANOVA as described previously (20). The relationships among MDRDE-eCrCl, pure mCrCl, SCr, creatinine appearance rates (CARs), and age were examined by least-squares regression analysis. CAR was calculated as the sum of dialysate and urinary creatinine mass removed in a 24-hour collection (expressed in mg/min). Baseline characteristics of the ADEMEX population analyzed here are shown in Table 1. No significant differences were found between subjects randomized to the treatment or control groups. However, mCrCl was significantly different between treatment and control groups (Figure 1), as shown in the original publication (20). Notably, when CrCl values were averaged over time during the study, a significant difference between the treatment and control groups was apparent using either of the MDRDEs, mCrCl, or SrCr (Table 2). Conversely, overlap of individual period-specific CrCl values estimated by MDRDEs between the treatment and control groups was apparent with either the 4V- (Figure 2) or 6V-MDRDE (data not shown), blurring the differences in pCrCl that one expects through randomization. SCr rose over time in the entire cohort (data not shown), a finding expected given the decline in residual kidney function in both groups. Mean change in total mCrCl with 95% CIs over time in control and intervention groups of ADEMEX. Total mCrCl was the sum of measured total pCrCl and rCrCl. Patients remaining in each arm are shown above the x-axis. Mean change in 4V-MDRD-derived eCrCl with 95% CIs over time in control and intervention groups of ADEMEX. Patients remaining in each arm are shown above the x-axis. The weighted mean average CrCl across all subjects over time was 5.97 ± 1.64 for mCrCl versus 5.60 ± 2.29 when using the 4V-MDRDE, yielding a statistically significant (P < 0.0001) mean bias (i.e., difference) of 0.37 ml/min per 1.73 m2. The agreement between mCrCl and 4V-MDRDE-eCrCl using the intermethod r and the inter-CCC was 0.82 and 0.76, respectively (Figure 3A). The lower value of CCC compared with r reflects overall systematic bias associated with the 4V-MDRDE-eCrCl noted above. A higher level of agreement was seen between mCrCl and 6V-MDRDE-eCrCl values (r = 0.85, inter-CCC = 0.82, respectively; data not shown) and there was no evidence of any systematic bias (a mean difference of 0.06 ml/min per 1.73 m2, P = 0.16). The total CCC was 0.56 between mCrCl and the 4V-MDRDE and 0.59 between mCrCl and the 6V-MDRDE. The intermethod r values and the inter-CCCs were minimally improved to 0.84 and 0.81 for the 4V-MDRDE and to 0.87 and 0.86 for the 6V-MDRDE, respectively, when pure rCrCl was used to estimate renal excretion, unaveraged with urea clearance values (data not shown). In contrast, when the analysis of the 4V-MDRDE-eCrCl was limited to functionally anuric patients (defined in ADEMEX as patients with a renal average of creatinine and urea clearance <1 ml/min per 1.73 m2) with a mCrCl <12 ml/min (essentially pCrCl), a clinically relevant cut point for dialysis patients, the r value decreased to 0.49 and the inter-CCC decreased to 0.42 (Figure 3B). Relationship between (A) mCrCl and 4V-MDRD-derived eCrCl and (B) mCrCl and 4V-MDRD-derived eCrCl limited to anuric patients with mCrCl ≤12 ml/min per 1.73 m2. mCrCl = pCrCl in the latter group. When ADEMEX data were analyzed in an observational fashion by ignoring randomization, no significant association between total mCrCl and patient survival was observed (hazard ratio [HR]: 0.96, 95% confidence interval [CI]: [0.90, 1.02], P = 0.16). However, when total mCrCl was separated into its components of pCrCl and rCrCl (Table 3), no association was found between pCrCl and survival (HR: 1.08, 95% CI: [0.98, 1.20], P = 0.12), but a significant association was found between rCrCl and survival: Every 1-ml/min per 1.73 m2 increase in rCrCl was associated with an 11% lower risk of death (HR: 0.89, 95% CI: [0.81, 0.98], P = 0.01). In contrast, for every 1-ml/min per 1.73 m2 increase in eCrCl derived by the 4V-MDRDE, there was a 6% increase in the risk of death (Table 3; HR: 1.06, 95% CI: [1.03, 1.10], P = 0.0002), and for every 1-ml/min per 1.73 m2 increase in eCrCl derived by the 6V-MDRDE, there was a 4% increase in the risk of death (HR: 1.04, 95% CI: [0.998, 1.08], P = 0.06). Findings were similar when data were examined by quintiles of eCrCl derived by the 4V-MDRDE, but there was no association between survival and quintiles of 6V-MDRDE-eCrCl (data not shown). Table 4 summarizes results from repeated-measures ANOVA in which CrCl was fit according to the method (4V-MDRDE-eCrCl versus mCrCl with residual kidney clearances estimated utilizing the average of both urea and CrCl and for creatinine alone). The analysis was adjusted for the effects of age and age by method interaction. Mean predicted CrCl values are shown for patient ages 36, 50, and 59 years corresponding to the 25th, median, and upper 75th quartiles of age in ADEMEX, respectively. When renal clearance was based on the average of urea clearance and CrCl, the mean of the true measured 24-hour CrCl increased from 5.85 to 6.10 ml/min per 1.73 m2 (lowest to highest age quartile, a change of 0.25 ml/min per 1.73 m2), whereas the 4V-MDRD-eCrCl increased from 5.07 to 6.14 ml/min per 1.73 m2 (a change of 1.07 ml/min per 1.73 m2). The mean bias associated with 4V-MDRDE-eCrCl was approximately 0.8 ml/min per 1.73 m2 lower than the mCrCl in the youngest age quartile (P < 0.0001). Conversely, with advancement in age to the oldest quartile, there was a progressive increase in eCrCl by the MDRDE, with values that eventually overestimated the actual mCrCl. Greater discrepancies were noted when only creatinine was used to assess the renal contribution to mCrCl. These age-related trends in mean bias were also present when the 6V-MDRDE was used (data not shown). There was an inverse correlation between MDRDE-eCrCl and CAR as shown in Figure 4 (r = −0.28, P < 0.001). Conversely, there was a positive correlation between mCrCl and CAR (r = 0.29, P < 0.001). These correlations should be considered quantitatively approximate because they include a variable number of values for each patient. The relationships among SCr, age, and CAR for the patients in ADEMEX demonstrated a negative correlation between age and both SCr and CAR (P < 0.0001; data not shown), with younger age being associated with higher levels of SCr and CAR. These reported relationships were not substantially altered if CAR was adjusted for endogenous creatinine metabolism (data not shown). Correlation between 4V-MDRD-derived CrCl and CARs. CrCl values are expressed in ml/min per 1.73 m2; CARs are expressed in mg/min. The objective of our analysis was to assess the utility of MDRDEs as an alternative to mCrCl in patients with ESRD treated with PD. Our evaluation was prompted by previous investigations demonstrating agreement between formula-derived CrCl and mCrCl (18,19) and inferences by these investigators that MDRDEs be used to compare small-solute clearance across kidney replacement therapies (18) or as a simpler means to assess adequacy for individual PD patients (19). We will approach these two issues separately. First, the results of our analysis confirm those of Khosla and Steiner (18) and Virga et al. (19) in that MDRDE estimates of CrCl provide an acceptable degree of correlation (i.e., precision) with 24-hour total mCrCl (Table 2 and Figure 3A). This is true irrespective of whether rCrCl is taken as the Kidney Disease Outcomes Quality Initiative recommended average of renal urea clearance and CrCl (21) or as pure “unadorned” CrCl. Additionally, although we did not restrict analysis of data from our study cohort to 24-hour creatinine collections differing by <25%, as done by Khosla and Steiner, our use of the inter-CCC to assess the level of agreement closely mirrors their approach. By excluding patients who did not have “repeatable” 24-hour collections, Khosla and Steiner were effectively estimating the level of correlation between methods among patients with minimal intrasubject variation in consecutive 24-hour collections. This is precisely what is measured by the intermethod r and the inter-CCC. The total CCC, which in the ADEMEX study was 0.56 between mCrCl and that estimated by the 4V-MDRDE and 0.59 between mCrCl and the 6V-MDRDE, reflects some attenuation of the agreement between methods over time when intrasubject and intersubject variability are taken into account. Nonetheless, when examining agreement between MDRDE-eCrCl and mCrCl for the whole cohort, agreement is good. As such, our analysis suggests that these equations might serve as an epidemiologic tool to provide a means of comparing CrCl for large populations across kidney replacement modalities, especially those providing more continuous waste removal such as PD, daily hemodialysis, and kidney transplantation. The above demonstrated correlations notwithstanding, our evaluation suggests significant limitations of MDRDEs in assessing adequacy for individual PD patients. Clinicians formulate PD prescriptions on the basis of individual patient characteristics (small-solute volume of distribution, peritoneal membrane transport type, and residual renal function) to achieve adequacy targets and relieve uremic symptomatology. Sequential adjustment in the prescription to augment peritoneal removal of waste occurs with failure to achieve either of these goals. Yet in our analysis, MDRDEs were relatively insensitive in their ability to accurately discern individual period-specific prescriptive changes in pCrCl noted between the ADEMEX treatment groups compared with the control group (Figure 2) that were clearly detected by direct determinations of mCrCl (Figure 1). Similarly, agreement between measured and estimated methodologies was compromised when evaluation was restricted primarily to CrCl occurring via peritoneal elimination (i.e., functionally anuric patients with a pCrCl < 12 ml/min; Figure, 2b). These findings are not surprising given that MDRDEs, even in the predialysis population, only provide a clearance value within approximately 30% of the correct value 90% of the time. Additionally, narrowing the range of values for linear regression further restricts the association. Notably, values of CrCl compared here in ADEMEX (and in most PD-treated populations) are restricted in range (approximate total CrCl approximately 50 L/wk per 1.73 m2, or 5 ml/min per 1.73 m2 for the whole cohort with only 10.87-L/wk per 1.73 m2 or 1.1-ml/min per 1.73 m2 difference in pCrCl achieved between the two arms of ADEMEX). Irrespective of cause, this poor discernment of pCrCl is a concern and a limitation of MDRDE estimates when applied to individual PD patients. Perhaps more importantly, our analysis illustrates how estimation of CrCl on the basis of SCr (and demographically assigned creatinine production rates) is hindered by the dual conflicting surrogacies of SCr for muscle mass and small-solute clearance. More specifically, MDRDE estimates of CrCl do not account for individual differences in creatinine production. Our analyses demonstrated that MDRDE-eCrCl is inversely associated with CARs (Figure 4) and age. As such, older and more debilitated patients having lower SCr values, reflective of decreased muscle mass, will be assigned artificially high CrCl by the MDRDEs. Conversely, for an unusually high creatinine producer (i.e., younger, athletic male individual), the MDRDEs will assign a falsely low CrCl. This age-related bias is clearly illustrated by the example in Table 4. MDRDEs (particularly the 4V-MDRDE) assign lower-than-average CrCl to younger patients having more muscle mass and assign higher-than-average CrCl to older, more debilitated patients. Although it might be suggested that MDRDE-eCrCl could be used to compare CrCl values over time on therapy against a mCrCl value obtained at the start of PD therapy, temporal changes in patient muscle mass coupled with an inevitable decrease in residual kidney function could lead to failure to appropriately adjust the PD prescription. The above described phenomenon undoubtedly also explains the inverse relationship noted here between MDRDE-eCrCl and patient survival, an observation opposite of that which exists for the nondialyzed CKD population. Survival in the ESRD population is associated with higher muscle mass and CARs (22,23), both surrogates of overall younger age and better overall health. This relationship has been shown to apply even in the general population (24). As noted above, MDRDEs can falsely suggest a high clearance and thus better survival associated with low SCr concentrations and low CARs, when in fact clearance and survival could be poor because of age and/or debility. The converse would be true for the high creatinine producer. It is instructive to compare these findings using MDRDE-eCrCl in PD patients with those in the nondialyzed CKD population. The direct relationship demonstrated between patient survival and measured or estimated clearance in a nondialyzed CKD population occurs over a wide range of clearances (i.e., 60 ml/min to <15 ml/min) (16,17). However, methodological artifact due to the individual differences in creatinine production described above may have a disproportionate influence in the extremely narrow range of clearances present in the ADEMEX population, or by extension, any population with restricted, low CrCl. Indeed, had we analyzed a cohort of nondialyzed CKD patients with 10 ml/min per 1.73 m2 in the same way, we quite likely would obtain the same counterintuitive result. Notably, multiple studies in recent years have explored the relationship between eGFR at the start of dialysis and survival and have described similar counterintuitive findings, even when corrected for age and comorbidity (25–28). As such, we do not believe our observation is highlighting anything particular about the PD population and MDRDE-eCrCl. Rather, our analysis is most likely identifying a limitation of MDRDEs applied to a population of patients with unevenly distributed multiple comorbidities over a limited range of CrCl values. It is noteworthy to mention here that MDRDEs do not separate peritoneal from renal clearance, and it is the latter that is associated with survival in this population (29). Our study has several limitations. Our analysis was restricted to Hispanic subjects of younger age and lower body mass index than in the other studies cited. However, given that all studies normalized values to body surface area, the effect of size and ethnicity should be minimal. 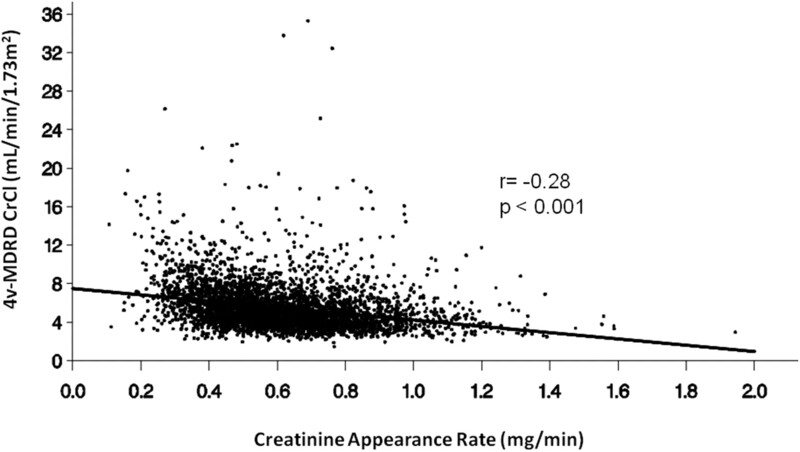 We also did not examine the value of the multiple creatinine-based equations tested by Virga et al. (19) in their ability to estimate mCrCl or to predict survival. However, we would expect comparable results because any creatinine-based equation will be subject to similar limitations as those for seen with MDRDEs. In summary, on the basis of findings here, MDRDEs appear to provide reasonable cross-sectional estimates of mCrCl across a population of patients with ESRD treated with PD. However, in contrast, MDRDEs should not be used to assess small-solute removal or adequacy in individual PD patients or to predict outcome in any cohort of patients over a narrow range of limited clearance. Drs. Sloand, Leypoldt, Culleton, and Gellens are employed by Baxter Healthcare Corporation. We appreciate the helpful editorial assistance provided by Rona McGreevy.